Note: My last blogpost was about my 2013 resolution: avoiding negativity, cynicism and spite. This entry might come across as negative criticism but my rationale here is to highlight what I think is an injustice, and look toward positive improvements that could fix this problem. With that qualification out of the way, let’s begin! A colleague today mentioned the newly-announced Edge Conference — an event covering “advanced web technologies for developers and browser vendors”. It’s organised in partnership between the Financial Times’ Labs group, Google, and Facebook. I had to go back and check a second time to be sure: 22 speakers, all male. Not a single woman (at the time of writing). I can’t remember the last time I saw a single-day web conference with this many speakers, which only makes it worse. If they’d featured one woman alongside 21 male speakers, it would’ve been embarrassing. To feature none looks almost deliberate. The lineup of speakers is brilliant — there’s some of the leading lights of the British web development scene on that list. But none of them are women. 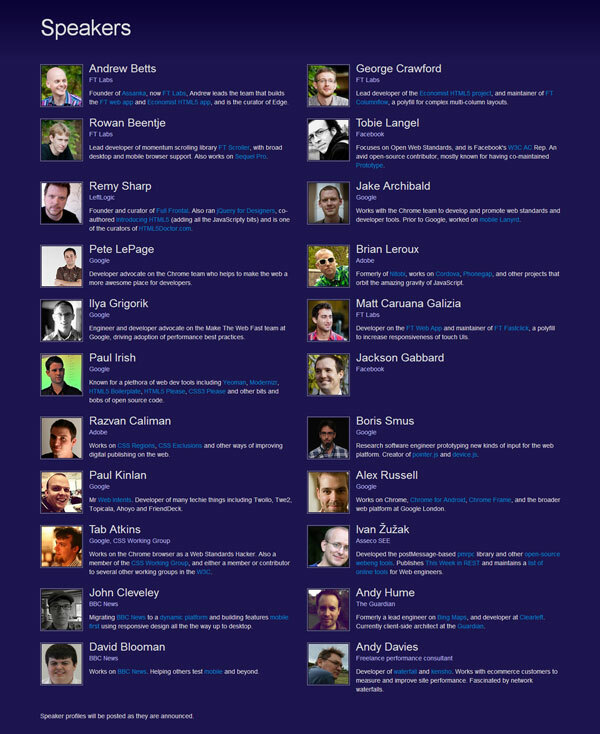 Are there no women out there worth a place amongst these 22 web technology experts? I pressed him, asking him if he really didn’t think they were any worthy female speakers to be found. He replied that my argument was a straw man, and that he wouldn’t be “debating” it further. I was massively disappointed (and haven’t heard back since, despite further requests for clarity). Now, I’ve seen Andrew speak at events before and he’s very good — a talented developer, innovative thinker and all-round nice guy. I don’t for a minute think he’s sexist or deliberately curating an event which doesn’t include any female speakers. His refusal, though, to engage with my (and others‘) concerns about the representation that Edge Conference offers, is a big issue for me. His comment about being “happy with our process” doesn’t cut it in 2013. I’ve seen excuses from other criticised conference organisers, saying that they couldn’t find any female developers, or the ones they asked didn’t want to speak, or that their specific niche just doesn’t have that many female developers — I don’t think it’s good enough any more. And, if I’d genuinely been unable to find any women using my mysterious “process”, or all the ones I’d asked weren’t interested, or some freak event meant that any available woman was swept into a hurricane on the day of the conference and would be unable to attend, I would have added a note stating as much, prominently, underneath the pictures of 22 men, not leaving it to attendees to draw their own conclusions about my interest in encouraging equality at developer events. I appreciate the hard work and often high costs that go into organising a conference. It’s perhaps unfairly easy to pick on developer-focussed events for being overly male in demographics, especially in an industry where female representation is particularly low. The Guardian’s own recent Scale Camp was poorly attended by women, both in terms of speakers and attendees — this stuff is hard. I don’t want to start a Twitter mob or cause a conference to be cancelled. But I do want to know why a well-intentioned group of developers and companies have managed to create an event stunning for its cheap price, its strong technical themes, and its hugely disappointing lack of the most basic diversity — and it won’t even acknowledge there’s a problem. The Edge Conference tagline states that attendees will “debate what’s broken, and how we can fix it”. I have a suggestion for a topic. Postscript: It’s worth adding that I don’t have a problem personally with Andrew or the other organisers here. There’s a really good discussion about the cancellation of BritRuby here, touching on these issues and more. It’s a complex thing and something that shouldn’t necessarily be debated over social media and blogs, but for my money, it’s absolutely crucial to constantly be thinking about it. As I acknowledged in my resolution blogpost, it’s much easier to sit back and criticise the efforts of others than to make that effort yourself. I believe that in this case, staying quiet about something that massively surprised me, a straight white male with a beard (eg. a typical web conference’s target demographic), is impossible. I’d be really happy to be proven wrong; to be told that the organisers did everything they could to reach out to some of our many talented local female developers, but I’d still question why, if this was the case, this wasn’t explicitly stated up front. Post-postscript: Andrew and team have posted an FAQ statement on the site after Andrew and I went for a coffee and a chat about this article and the conference. It clarifies a few things I raise here and confirms that the people behind EdgeConf aren’t sexist, women-hating misogynists (as I hope nobody seriously suspected) but perhaps made assumptions that others shared their viewpoints on speaker selection criteria. Anyone calling for boycotts and cancellations should read this first before engaging angry mob mode on Twitter. Martin Belam wrote an emotive blogpost titled “One day my daughter will ask me how we tolerated this“. I was going to pick out a key quote to summarise but the whole thing is brilliant so just go over there and read it all. Kate Bowles wrote a good piece called “Nothing personal“, reflecting on the statement by EdgeConf and her experiences in the academic world with these issues. The Atlantic began a campaign kicked off by Rebecca Rosen calling for speakers on all-male conference rosters to “refuse to participate unless there are women on stage with you“. It’s a bold request and while I’m not sure boycotts are always the answer, emphasising that these things are as much about individual responsibility as they are about society-wide concerns is a good point to make.